Chickadee started life in Indianapolis, IN in 1955. Was purchased by Dr. Charles “Chick” Comer for his brother Dr. Kenny Comer, who had just bought a summer cottage in upper Wisconsin on Little Saint Germain lake. Very soon after the purchase Dr. Chick passed away before having had a chance to ride in the boat. So you can see where the name came from. In 1965 we meet Dr. Chicks son Dr. Jonathan “Jot” Comer and his wife Gwen at Great Lakes Naval Training Center where we were both serving as Dental officers. During the course of the next few years, we would meet and became friends with all associated with the Chickadee. As age took its course Dr. Kenny died and wife Clair wanted Jot to have the boat. It was hauled to Mooresville, IN where the families lived. 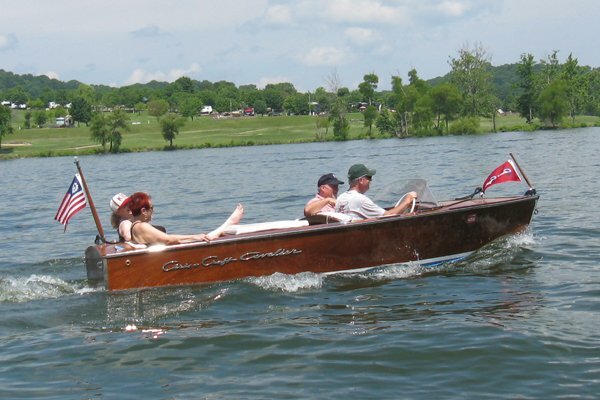 We traveled to Mooresville each year for the 500 and Jot and family came to MO in the summer to boat. We brought the boat to Springfield for minor repair and to run it on Table Rock lake. A couple of years later the boat went back to IN to be used there for one year. That winter Jot died from prostate cancer. The boat was stored for two years before we bought it and brought it back to Springfield in 2001. At that time it underwent a complete refinishing and motor rebuild, bring it to modern standards. It now resides on Table Rock Lake at the Ozarks Yacht Club dock on Indian point. It comes out for evening rides and ACBS events. E Z Rider is a “Lapstrake” built with lapping plywood strips on white oak frames. The deck trim is mahogany plywood, the seats are mahogany. The boat was built in Sandusky, Ohio. The original owner Mr. Von Ellis owned the boat until 1975. After several owners, Bob Van Dyke purchased it in 2007 but never put it in the water. We purchased it from him 4/27/2011. The first cleanup process included taking out the gas tank to clean it, overhaul the starter, glue the after deck back in place, plus a bit of varnish work. We tried it out at the sailboat club on Lake Keystone. The engine ran quite well but the boat leaked a LOT, anyway we took it to Table Rock and had a good time with it. After returning home I started stripping the paint inside and out. A previous owner had used bath tub caulk down all the seams on the bottom which started to peel back. It looked like hair hanging off the bottom. The boat was stripped to bare wood, then sealed with four coats of CPES inside and out before the primer coats were added. Four coats of Pettit Bright White finished the job. The windshield frame was badly split so I decided to try my hand at making one from scratch. I obtained enough Sapele board to do the job. It took a lot of figuring, cutting, gluing & routing to make a pretty decent looking windshield. All the varnished parts on the inside of the boat were stripped of varnish, most of the seats were split and needed to be glued back together, sanded, sealed and revarnished. The transom had been sanded through the veneer so back to the wood shop for more Sapele to build a new one. Bob Van Dyke had a previous Lyman named Easy Bottom. This one was E Z Bottom 2, but we renamed her E Z Rider because of the smooth ride you get in a lapstrake boat. After two years of work she’s a fun boat to have back in the water! 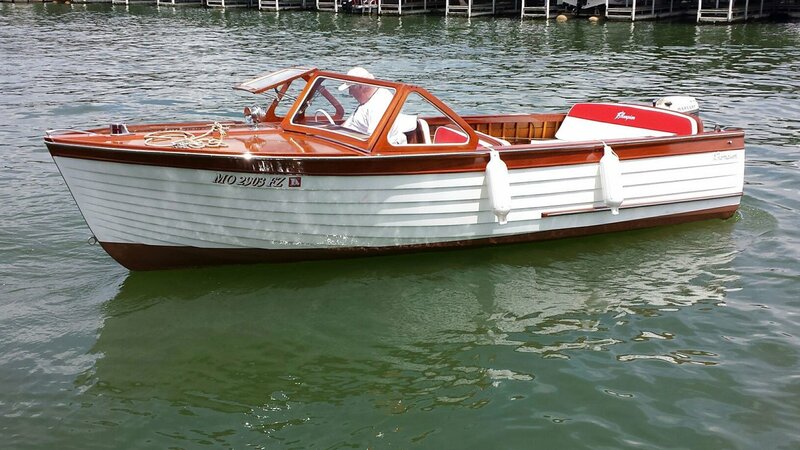 Miss Julianna was originally delivered in 1955 to Buckeye Lake in Ohio. Her Hercules Model A engine runs at 60 HP at 3200 RPM. She is made of Mahogany plywood. She was partially restored when Jack Pryor bought her in 2012. That restoration was completed in May of 2014. She was named after Jack’s granddaughter who was lost at birth. Miss Julianna has the distinction of being the only boat to be towed in twice at the 2013 Classics Cruisin’ Table Rock Lake event. 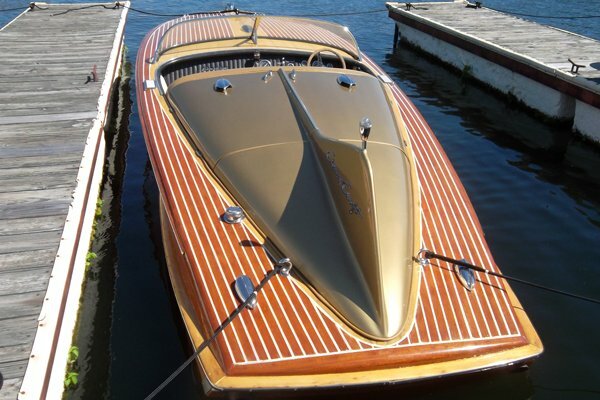 This 23 foot Chris-Craft Continental was delivered in May 1957 to Minnetonka Marine in Minnesota. 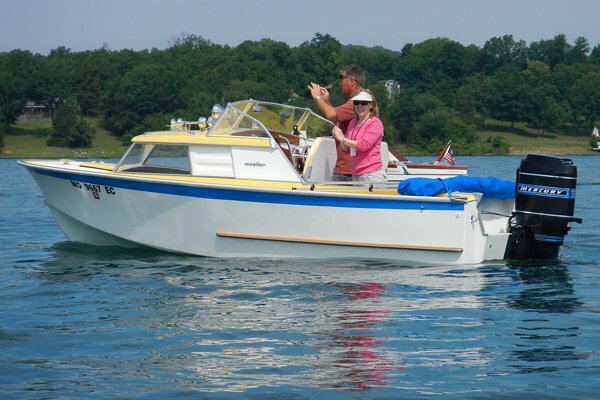 I purchased this boat in 2010 in good condition with a newer bottom and rebuilt engine. The previous owner,of 15 years ,was from Gig Harbor WA. The steering wheel is from a 1957 Lincoln Continental. The steering wheel and upholstery are cream and coral mist in color. We named the boat “Island Star”. The boat resides at our family cabin on Star Island in Cass Lake, MN. Jeff & Cherie Davis Kansas City MO. 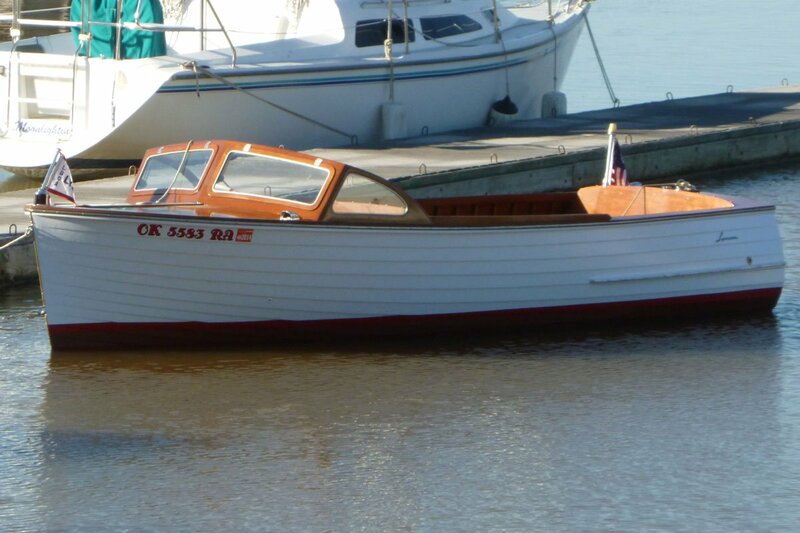 Carter/Rae is a 1957 20ft Holiday Chris Craft hull # HY-20-118 owned by Steve & Donnita Dagg. Delivered to Minnetonka, Minnesota on February 15, 1957. Material Wood King Plank. Powered Chris Craft M-130. We acquired her August 4, 2016 in Crosslake , Minnesota. The boat was in storage for 30 years. Gauges, Engine and new engine box cover rebuilt in Minnesota along with restaining and varnish. Brent Howard took out all the wiring and put in all new wiring and rebuilt the generator. The boat was brought up to coast guard standards and regulations. The seats were reupholstered with the original color by Moss seat covering. No adventures yet. That will be the next chapter. She is kept at Honey Creek Marina on Grand Lake, Oklahoma. 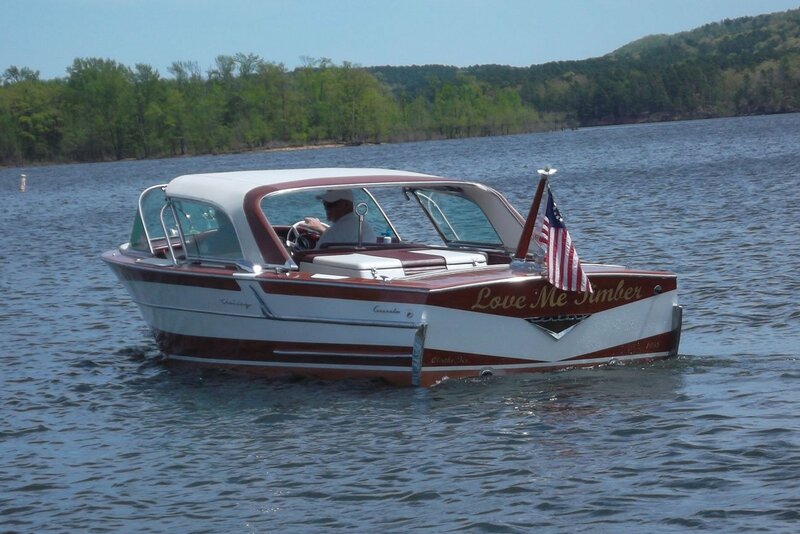 Love Me Timber was born in 1958 with a beam of 74”. Her heart is a Graymarine/AMC 327 that pumps out 240 hp at 3,800 rpm. 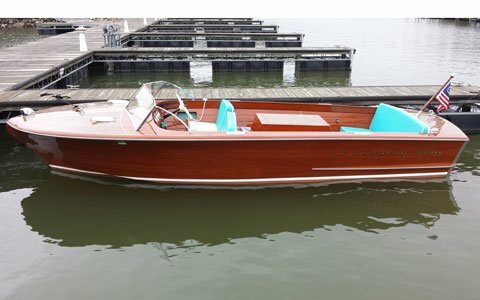 Known in the 50’s for their fast, powerful boats, the Century Coronado’s were record holders for pulling up the most (9) slalom skiers at one time. Therefore, the nickname the “Thoroughbred” of boats. Dr. William Springer, Manistee, Michigan, the first owner, brought her with him to Hot Springs, Arkansas when he retired from practice. She spent the next several years on Lake Hamilton and belonged to two different owners. 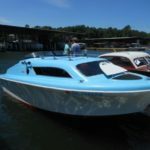 In the mid 70’s she was sold to Burney Whitfield of Myers Realty in Hot Springs who sold it to Steve Carter and Bill McCord of Salty Dog Boat Rentals. Burney’s daughter Kristi remembers the old boat she used to ski behind as spotless. 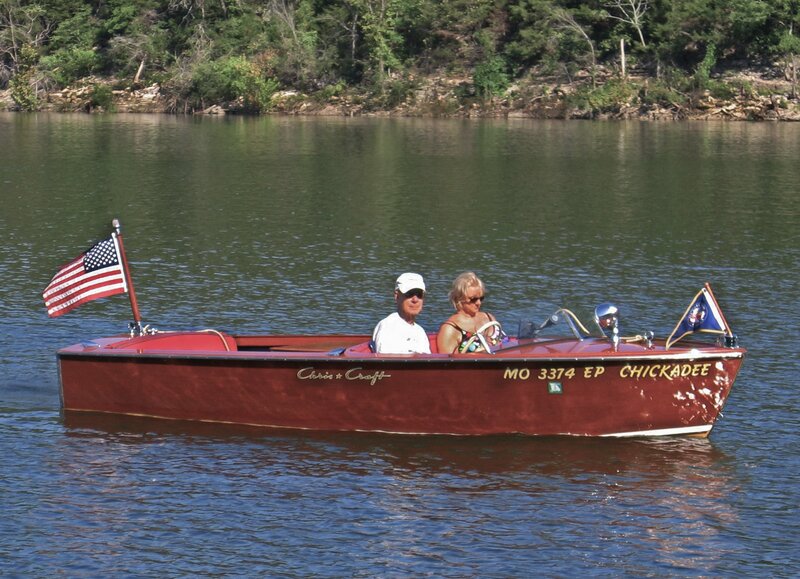 In 2001 J.C. Renner brought her to Table Rock Lake in Missouri for a family boat until she needed a complete restoration. However, after taking her apart, J.C. decided to sell her in pieces and advertised in Mahogany & Chrome. That’s where Kevin Hogan saw the potential though it was upside down on a rickety dolly. 60-70% of her framing was barely useable, even for patterns. The decision had to be made to re-plank with all new African Mahogany over Northern White Oak framing. By early fall of 2013 Love Me Timber was restored to brand new with the addition of many new hi-tech systems. She’s even better than when she was first purchased. The name is taken from an Elvis Presley song that was number one on the charts in 1958, Love Me Tender. And, I can truly say that after forming her ribs, fitting her coverings, applying her make-up, along with spending nearly 1200 hours bringing her back to life . . . I love her timbers. “N” 2 Deep was originally in the Great Lakes Area in Michigan. She was purchased by a man in Maine and now she is in Missouri. 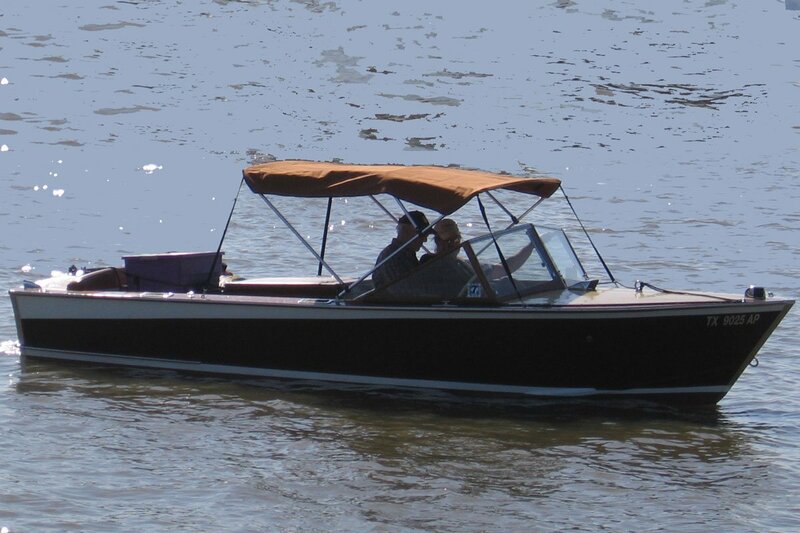 The Thompson is wood lapstrake with mahogany deck, dash, rails, seats and transom. The motor is 1960 Mercury Kiekhaefer 500. The motor was purchased out of a large Mercury Collection in Michigan. 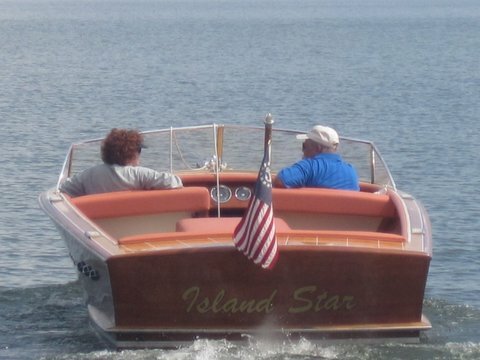 We bought the Thompson online from the owner in Greenwood, Maine in January, 2013. 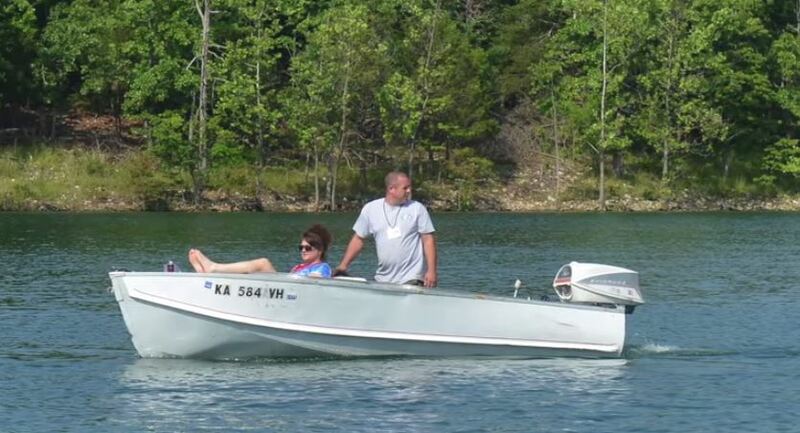 We brought her home in May, 2013 and spent two seasons on Lake Viking and one season at Lake of the Ozarks. Then she went off to Rice, Minnesota for restoration by Dave Watts at the Little Rock Boat Works. The interior work was done by Ken Biggs at K&S Upholstery in Smithville, MO. The reason for the name is because we have a considerable investment in her. Now, she is ready for fun!!! Irish Mist was a family ski boat purchased by Estle and Vondah Hunsucker back in 1962. She is powered by a 90 hp Chrysler Hercules inline, flathead, 6-cylinder motor. 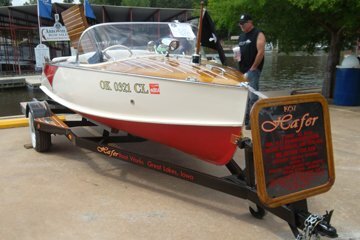 Irish Mist was restored during 2010-2011 by the Antique Boat Shop in Fort Wayne, Indiana. She is a wonderful vessel with all original Philippine mahogany. All that brought her back to life was getting her stripped, stained and varnished. All of the chrome work was redone. New upholstery was made and we had to replace the windshield. Lastly, we had her named. Her name is done in gold-leaf with a green clover. She is named Irish Mist to commemorate my father, Estle E. Hunsucker, who was known by many as “Irish”. Since the restoration, Irish Mist has had a handful of adventures. They include Grand Lake of the Cherokees, Table Rock Lake, and most recently, Beaver Lake. Ridiculous was purchased about 6 years ago. He bought the Glasspar with the intention of selling the parts, as the boat was in terrible condition. But once the boat was in the garage, Diann, his wife, thought the boat was cute, so Greg decided to restore the boat for her. The restoration of the boat took two years. Greg did all the restoration work himself except for the upholstery. Greg replaced the transom, the stringers, the floor, and a lot of fiberglass repair prior to painting the entire boat. He added custom accessories, such as gunnel storage and a rear seat. The original color was drab green and white but we wanted something fun and bright, hence the colors blue and yellow. We named the boat “Ridiculous” because of the amount of time and money it took to restore the boat. Unfortunately we do not know the history of the boat.